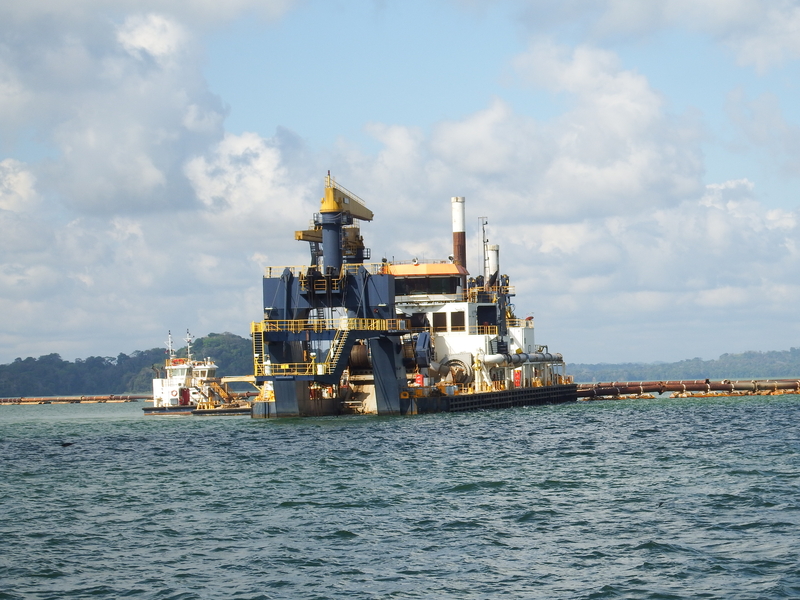 The “enlargement” of the Panama Canal involved a lot of dredging in Panama, as well as in ports served by the Neopanamax ships: deepening approaches, widening channels, and even eliminating islands in part or whole in Gatun Lake. I put the ” ” there because it’s more accurate to say “creating a third set of locks,” two sets were built a century ago. To illustrate click here; in the fifth photo, Atlantic Polaris is in set 1, and Nord Snow Queen in set 2. 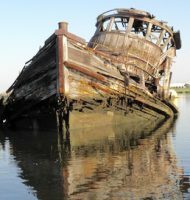 Try again, in the same post, the fourth photo from the end, Bow Summer is in the first set, and Ever Dynamic in the second. The third set construction site was visible back in 2012 here in the fifth photo, on the hill beyond Water Phoenix. 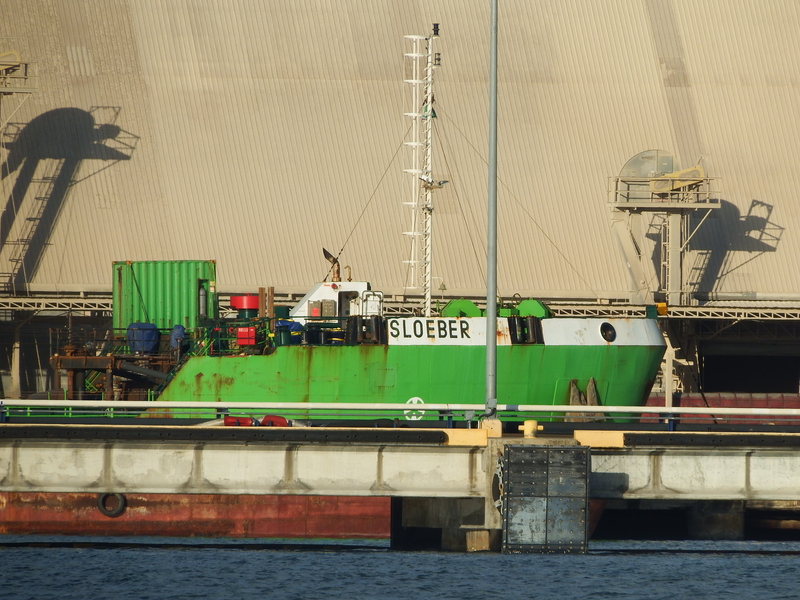 Sloeber, although the latter was behind a dock that obscured most of her. 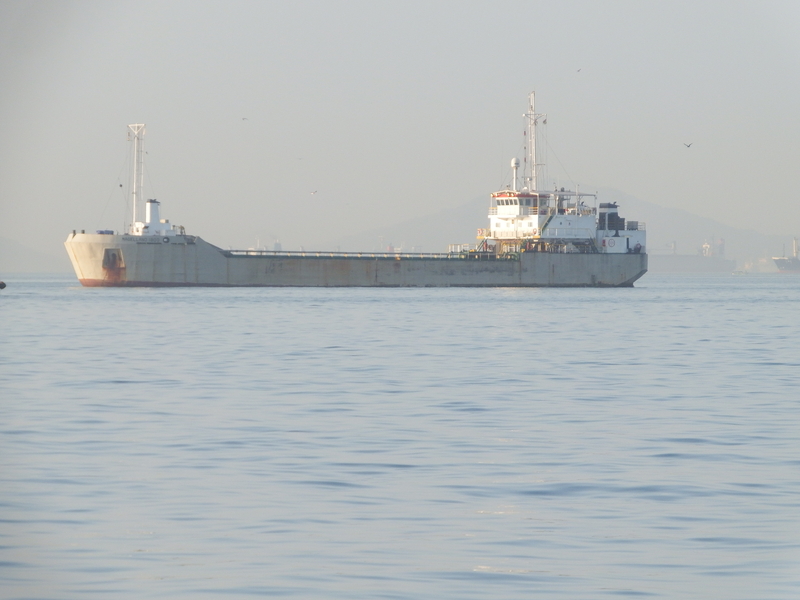 On the photo above, see the split midships on the bow; that’s how she bottom dumps, as a dump scow would. 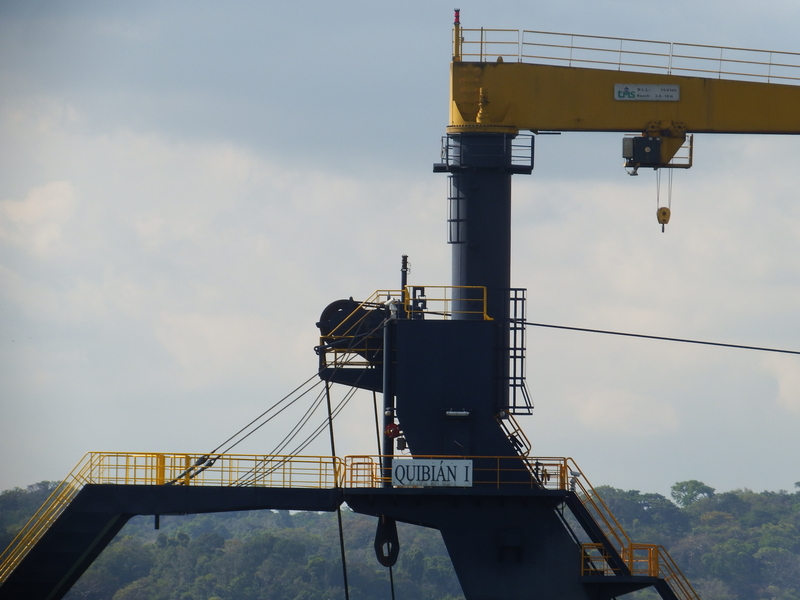 Quibian I is Panama-flagged and working in Lake Gatun, which is really the dammed up Chagres River. The tenders alongside include (far to near) Diablo, Espada, and Diablo II. 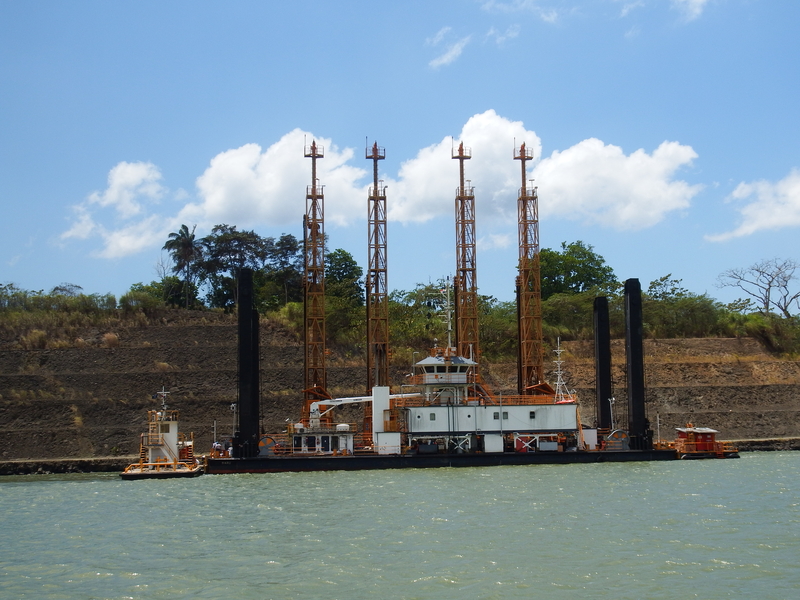 Drill barge Barú, proudly christened in 2006, is one of the dredge-related vessels operating near the Culebra Cut. 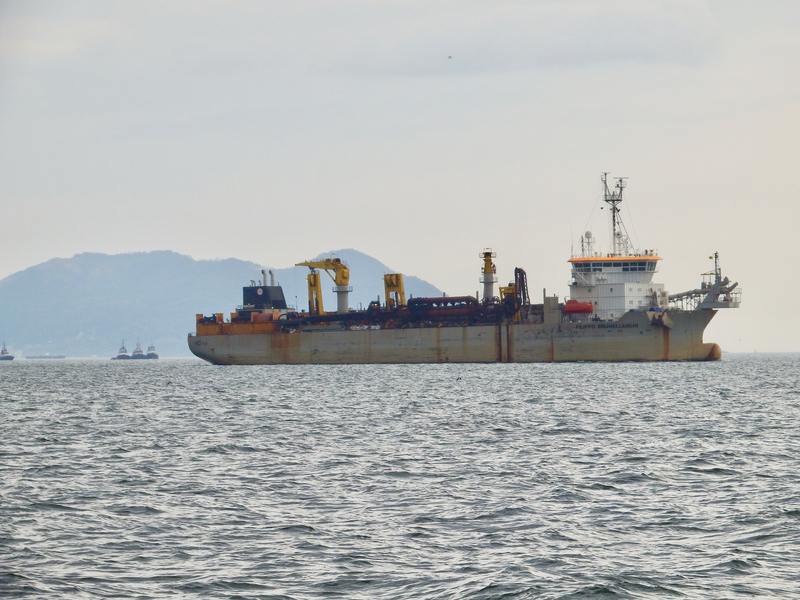 Barú, named for a Panamanian volcano, seems an appropriate name for a vessel whose mission is to drill holes so that charges can be set. Back in 2012, I got these photos of charges detonated after being set deep by Kraken, over in the Arthur Kill. The tender above and below is Chame II. 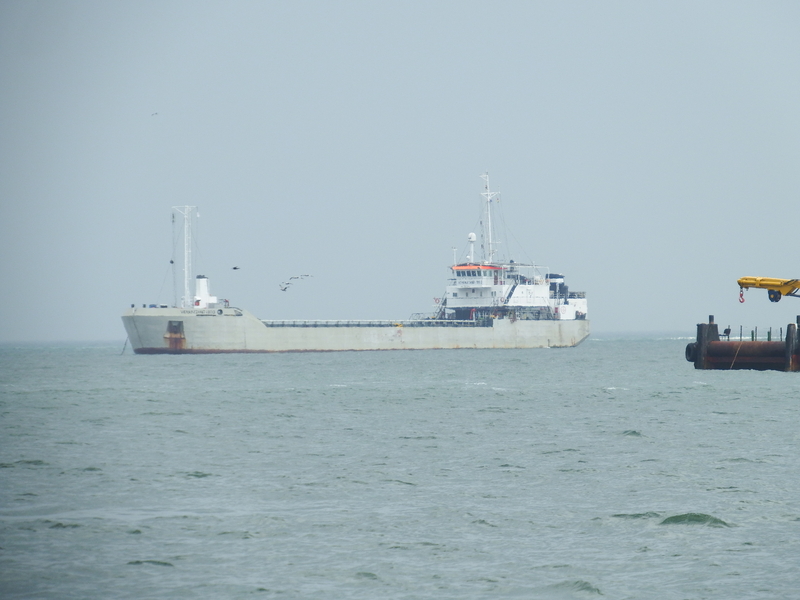 She followed us toward Culebra Cut while she was on a run to load more explosives. 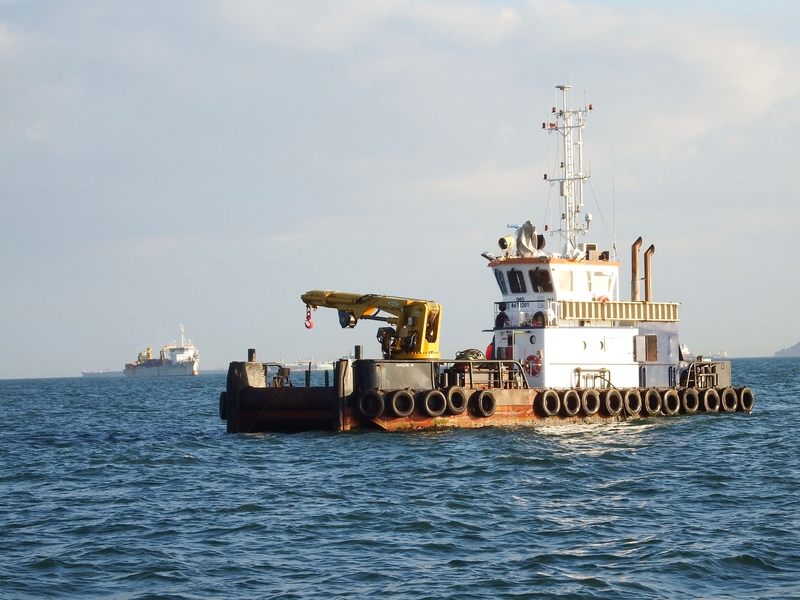 Over on the Pacific side, dredging is performed by Jan de Nul, a Luxembourgois dredging firm. 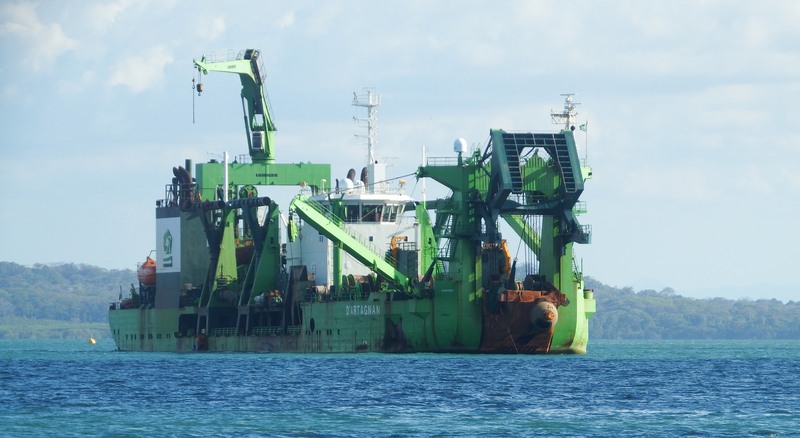 Filippo Brunelleschi ran day and night dredging the Pacific side approaches; a trailing suction hopper dredge, she can operate down to 124 ‘! 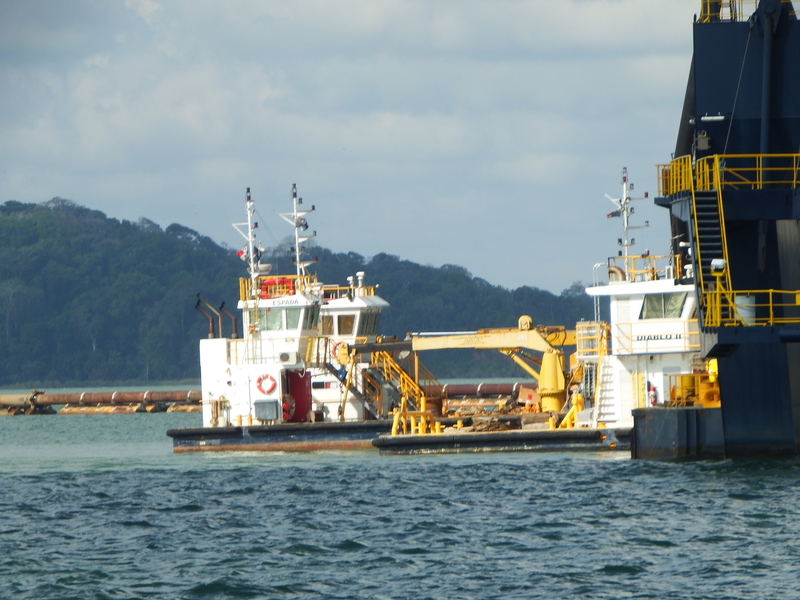 To digress, I’m not sure which tugs were there off the stern and in front of Taboga. 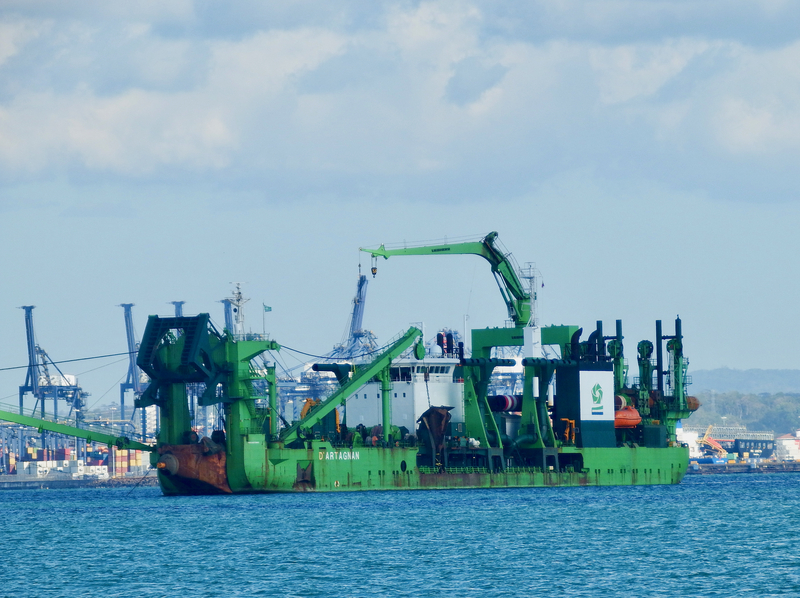 Not surprisingly for a European firm, Jan de Nul (JDN)–like DEME–uses self-propelled split hopper scows. 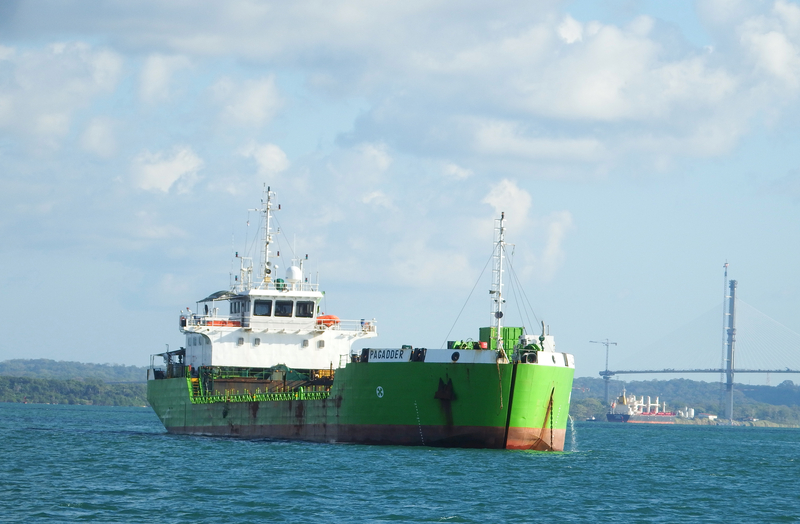 The two here are Magellano 1800 above and Verrazzano 1800 below, both flagged Mauritius (Port Louis) like the JDN tug we saw here. 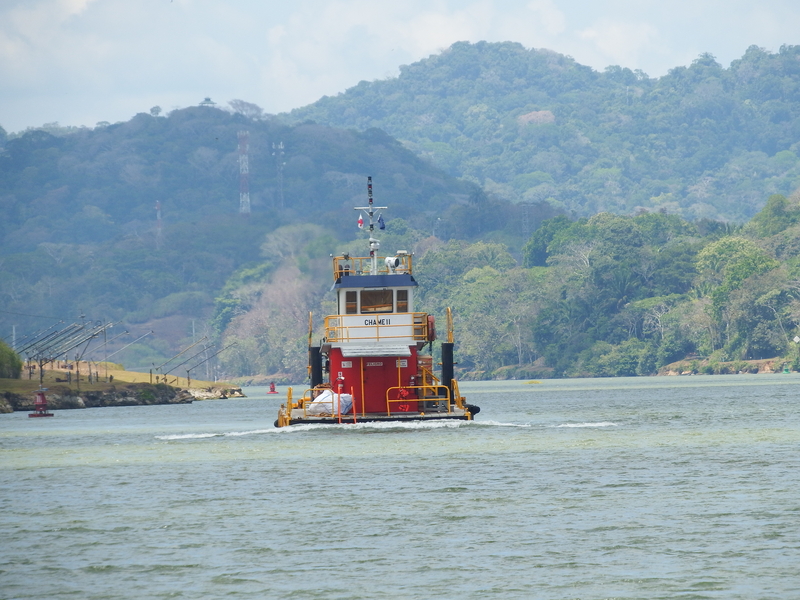 And finally, that’s Filippo B in the distance coming back in toward the Pacificside locks, passing Maggie M. I’m not sure why Maggie M was anchored here. All photos by Will Van Drop, who suggests these places to celebrate the green saint’s day. https://tinyurl.com/yac5t5n3 I find it difficult to walk a Civil War battlefield. It’s as though the spirits of those who died there are still present.